Team communication is a great way to improve your work productivity, but on its own, it’s not enough. To get the most out of Chanty, we’re introducing the integration with Zapier, the best automation tool out there – so that you can connect Chanty with more than 1,000 other tools in Zapier’s program. What does this mean for you? Take a look at Zapier’s integration list – if there’s an app you use there, you can easily connect it with Chanty. Now you can get a message every time there’s a new subscriber in MailChimp, a new entry in Typeform, a new lead in Pipedrive… The sky’s the limit. From discussing projects to setting tasks and monitoring changes in the apps you are using – Zapier gets you covered. 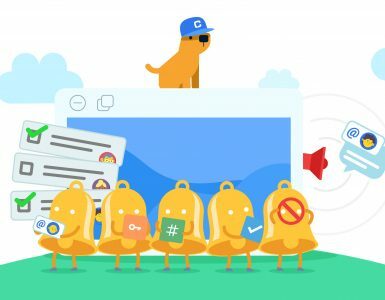 If you’re not familiar with Zapier yet, it’s a platform you can use to create automations between any of 1,000+ other tools which aren’t connected out of the box, including Google Calendar, Gmail, Jira, Asana, GitHub, Stripe, Salesforce and now Chanty! With Zapier and Chanty combined, you can make sure that your team communicates and collaborates effectively. Explore the world of Zaps and you’ll be surprised how much more you can be productive every day. Zapier is the tool that lets you automate processes instead of single tasks. It’s more than just triggers and actions, giving you place for customization to play with. 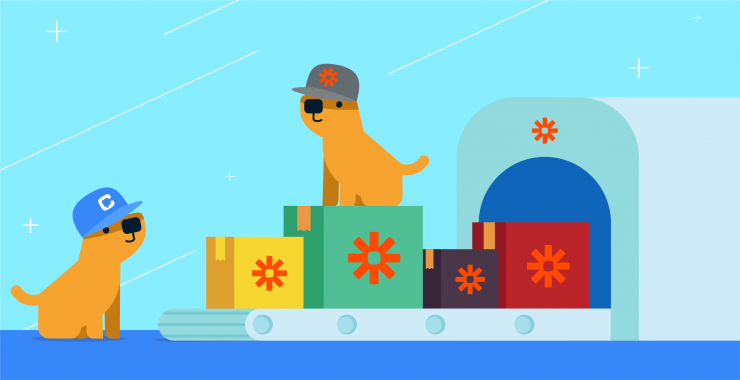 Once you start multi-step automations with filters, formatters, autoreplay and more fine-tuning, Zapier turns into a powerful tool that saves your time. High reliability coming out of the box. Zapier makes you confident that automations work properly and won’t skip tasks without any reason, like in the case of free Zapier alternatives. An absolutely huge amount of business apps surpassing any other automation tool. Need Stripe, Salesforce, Zendesk, Amazon EC2 or Custom Audiences in Facebook, Instagram or LinkedIn? Zapier gets you covered! Easy to follow tips and helpful resources to get you started. Zapier may look like it’s hard to cook, in reality it’s easy to learn because of the resources available. Starting with The Learning Center that comes with a quick start guide, inspirations and ultimate guides to apps for different teams, you are never alone in your automation journey. At Zapier blog you’ll find more productivity tips and ways of using the apps you can connect to the tool. Finally, there’s a landing page for each app with Zap ideas and info on other apps they’re commonly used with. Zapier gives an opportunity to start automating tasks with a Free plan and a 14-days trial for Paid plans for more tasks, premium apps, multi-step Zaps running at a time and advanced features like Filters, Formatters, Paths, Auto Replay, etc. Did you know that your team can share Zaps connected to your company apps without having to share credentials? Zapier for Teams makes it easy for deadline-driven teams to share effective workflows with one another. The pricing might seem restrictive, but that impression is deceiving. 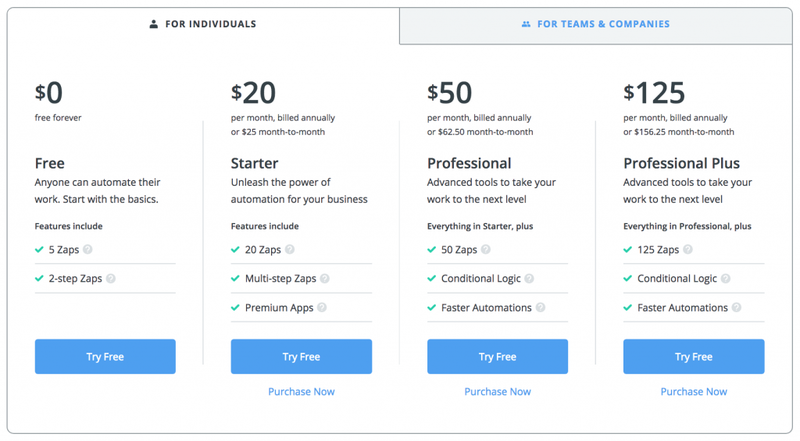 If you are not ready yet to build your own integrations with 1000+ business apps or need to save time automating routine tasks, Zapier Paid plan offers the best value for your money. You can achieve a whole new level of productivity integrating Zapier with Chanty team chat. We’ve done our homework and made sure you have presets with most requested apps to integrate Chanty with. Get updated with new events created on Google Calendar. Find yourself spending too much time manually adding calendar events to your team chat? Thanks to Zapier you will know about new events in any Public or Private conversation you choose. Receive new emails from Gmail directly in Chanty. Find yourself spending too much time checking the Inbox? This automation will automatically send you new emails from Gmail in a conversation on Chanty. Celebrate acquiring new subscribers on MailChimp. Need to keep track of your new subscribers added to MailChimp list without leaving the chat on Chanty? Zapier will automatically notify you with a new message in a conversation on Chanty every time someone new subscribes to your MailChimp list. Catch latest responses from Google Forms. We all run surveys and want to keep track of the answers asap. Now, every time you have a new response to your Form, you will receive a message in a Public or Private conversation on Chanty. Keep track of new records to Google Sheets. Maintain analytics up to date. Now you will know every time someone adds a new row to a Spreadsheet without leaving the team chat saving your time for more important tasks. Keep up with new commits on your Git version-control system. Spending too much time on keeping up with your project’s progress? Get up to speed with new bug fixes, features, and more without leaving Chanty. This integration will automatically notify you with new commits on Git with a new message in a conversation on Chanty. Stay updated about new tasks, issues or cards in your task manager. Chanty comes with built-in tasks feature. However, you can still automate your activity in Asana, Jira, Trello or another task manager. Get the best of both worlds by setting up Zaps to receive task updates directly in Chanty team chat. Never miss your new Salesforce leads. Need to know about new leads added on the Salesforce platform without leaving Chanty? This integration will automatically send messages about new leads created on Salesforce in Public or Private conversation on Chanty. Monitor your sales activity on Stripe. Every customer is important. Make sure to get latest updates on new customers added to Stripe directly on Chanty. Get notified of new deals in HubSpot CRM. Want to monitor your HubSpot activity without leaving the chat? This integration will automatically create messages for new deals created in HubSpot on Public or Private conversation at Chanty. That’s our list of presets making your quick start with Chanty on Zapier that much simpler. We know you can do more with your favorite apps and imagination. Check our self-study guide for more details on how to connect Chanty team space with any app on your Zapier account. 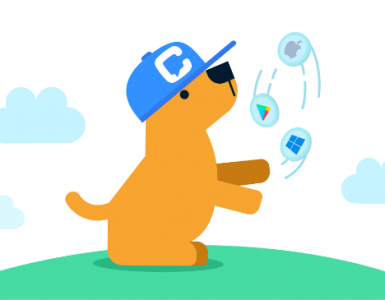 Visit Chanty on Zapier and hit Connect Chanty to 1,000+ Apps to start automating on your own. Missing something? Let us know about your own favorite Zaps or tweet @zapier sharing your ideas.